I just made a big batch of my Favorite Whipped Creme to go with our pies at Thanksgiving. I like to make this a few days ahead of time because it thickens up quite a bit if it sits in the fridge for a while. Also for the thickest cream shake a can of coconut milk....If you don't hear the liquid sloshing around you have a good thick hard cream at the top of your can. I also like to punch 2 holes in the bottom of the can with the hand bottle can opener things and drain the liquid out first. I store this in a jar in the fridge and use it as a liquid base in smoothies! Then I open up the top of the can and scoop out all the thick cream. Today five cans of coconut milk gave me about 1 quart of liquid and just about 5 cups of whipped creme. We've made this whipped cream a few times, and our family really loves it--especially on the carrot cake! I have a question for you: What do you do with the rest of the coconut milk after you scoop out the thick stuff? Do you just throw it away? Melissa, Oh no I don't throw it away! I usually put it back in the fridge and use it as part of the liquid for a smoothie the next morning! Makes a great rich creamy tasting smoothie! Does this whip up like whip creme? I ask b/c I tried twice and it stays runny. How long do you whip for? Do you add the sucanat (does the whip cream stay white?) and vanilla before whipping? 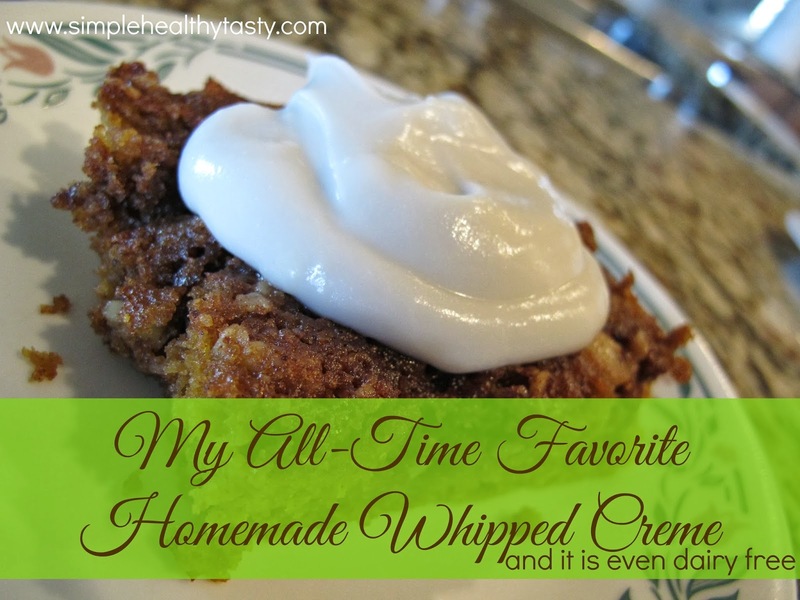 The first few times I made the whipped cream it did whip up just like whipping cream and was nice and thick. But it seems like sometimes I get a can of coconut milk that either has less fat in it so not as much thick stuff or with the warmer weather it isn't cold enough or something. I did talk to a pie maker who seems to make it great every time. She said that you need to whip the coconut creme (just the thick white stuff) before adding anything else. Then just fold in the other stuff. If you use Sucanat it will be kind of tan if I want it to look pretty and be white I usually get some organic sugar. I think temperature plays a big part. I have been keeping a couple of cans of coconut milk in my fridge all the time now. So that way I know it will be cold enough if I need it. I hope that helps it can be kind of hit and miss. But either way we have been know to eat it runny and still enjoy! Where is the best place to buy coconut milk and a good price and good quality? Dione: I usually get mine from Azure Standard or Wal-Mart. The Thia brand is good it's in the ethnic foods section. Just be sure to have it in the fridge for a few days so it's good and cold because I have found that brand to be a little runny form whipped creme at times. It makes wonderful ice cream though. do you only use organic berries/strawberries? if so, where do you get them for a good price? Rachel: I do not always use organic only. But when I find them for a good price I do. I have found if I watch my local health food store "Good Earth" when berries are in season they will a lot of times have organic ones on sale for a really good price. Also Azure Standard co-op sometimes has organic fresh and/or frozen berries that go on sale. I think the best thing is to grow your own. I can't wait until my plants are mature. We have strawberries that are finally starting to multiply and produce some. And we will have quite a few black berries on our bush this year. I'm so excited. I also plan to plant raspberries and blueberries we just haven't done it yet. FeistyGirl: Feel free to share that cranberry salad recipe!!!! Use the liquid with your pancake mix - it makes them so fluffy! Cassie: Excellent idea! I will have to try it! Hi Tammie, i see you have some new receipts here. any ideas on chili con carne with beans? also love your desert ideas where do i purchase your desert receipts? Humm Ultra Gel? I'm not familiar with it, I don't think I have ever used it but if I were looking for some I would probably try Amazon.com first or your local grocery store may carry it.